Academy Award? winners Cate Blanchett and Geoffrey Rush join Academy Award? nominee Clive Owen in a gripping historical thriller full of suspense, intrigue and adventure! When Queen Elizabeth's reign is threatened by ruthless familial betrayal and Spain's invading army, she and her shrewd advisor must act to safeguard to the lives of her people. But when a dashing seafarer, Walter Raleigh, captures her heart, she is forced to make her most tragic sacrifice for the good of her country. Elizabeth: The Golden Age tells the thrilling tale of one woman's crusade to control her love, destroy her enemies and secure her position as a beloved icon of the western world. Command the Wind! Summon the Hurricane! Shekhar Kapur picks where he left off in telling the story of Elizabeth Tudor in 1998 by presenting his interpretation of the latter half of the Great Gloriana's reign in this 2007 sequel. It begins in 1585. Elizabeth has been England's ruler for over a quarter century, and is now 52. She deals with threats of invasion by Spanish King Phillip II(Jordi Molla), her ex-half-brother-in-law, and plots against her that are a little closer to home by Scottish Queen Mary Stuart(Samantha Morton), her Catholic cousin, whose legitimate claim to the English throne is supported by Spain and Rome, but who arguably overplays her hand in dealing with her cousin. Meeting with her council members, her chief advisor Francis Walsingham (Geoffrey Rush)advises her to monitor England's Catholic population more closely. While omitting her famous line, "I will not make a window on men's and women's souls", the Queen's(onscreen) actions reveal this. She vows to punish her people only based only on their deeds, not their beliefs (which in reality, didn't happen). The story omits the Queen's most trusted advisor, William Cecil, as well as Robert Dudley, Sir Robert Cecil, and Robert Devereaux, and focuses on her relationship with Sir Walter Raleigh (the ruggedly handsome Clive Owen, with radiant charisma, but looking as though he stepped from the canvas of an oil painting), who has just returned from the New World, having named the colony of Virginia in honor of the Virgin Queen, with the bounty of the New World, a few Native Americans, and pirated treasure from Spanish ships in tow. One has to overlook many historical inaccuracies to enjoy the performances of the beautifully intelligent Abbie Cornish as the Queen's ward, and most-favored lady-in waiting, Bess Throckmorton, Christian Brassington as the Archduke of Austria ( whose appearance recounts an episode of the storied Queen's life that took place earlier than the 1580s), David Threfall as Royal Astrologer, John Dee, whose prediction of a war between two Empires, and vaguary surrounding those details troubles Elizabeth, Eddie Redmayne, as Anthony Babington, the Jesuit's recruit to assassinate the English Queen, Rhys Ifans as co-conspirator and envoy to Spain, Robert Reston, and Adam Godley as Francis Walsingham's traitorous brother, William. We are led through sundry intrigues, and court rituals, as well as the Queen's dramatic response to a threat by a Spanish Ambassador in which she claims to have an internal "hurricane that can strip Spain bare", before we come to the high drama surrounding the trial and execution of Mary Stuart, an incident which causes Elizabeth much distress and may well have made her re-live the similar scenario involving her own mother, although she may have been too young to remember the latter.Tom Hollander's Sir Amyas Paulet, presides over the Scottish Queen's demise. Under the observant eye of his daughter, the Infanta Isabel (who was actually 21 in 1588, but here is portrayed by child actress Aimee King, decked out like a 16th century Wednesday Addams),a vengeful King Phillip, who supported Mary Stuart, declares Holy War on England.Elizabeth has to forgive Raleigh's seduction of Bess to appoint him as captain of her naval forces. The climax of the film is the dramatic confrontation of the Spanish Armada, where Henry VIII's once unwelcome daughter presides over an astonishing victory. The cinematography of this scene is particularly bold. Dealing with life and death matters among her closest subjects shortly thereafter, she settles into her role as mother of her people, and helps England close the 16th century on a golden note. The acting and the costumes are superb, and I have often felt the best historical dramas are ones that resemble moving oil paintings of the time they depict on canvas. Director Kapur succeeds in creating that effect here. My DVD player is set for Korea. It won't play the DVD, it says "check the region". COuld I return it? But I really want this product - how can I get one for the right region? The best Elizabeth ever made!!! If you love period epics, fantastic costumes, and each frame a visual beauty. Oh yes, and a really good story pulled from history. Than you will enjoy this film! The acting is top drawer, Kate is fantastic as as this amazing woman who was Queen Elizabeth! Enjoy! 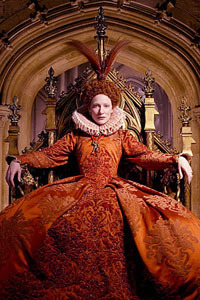 The best of the two Cate Blanchett portrails of Elizabeth I. This one had move of a decent storyline and dramtics than the other. This is pretty much what I was taught at Oxford University during a course on Tudor History. At once more ambitious and less intriguing than its predecessor, Elizabeth: The Golden Age certainly isn't the abject disaster reviewers claimed on its theatrical release, although it's not nearly as engrossing as the original. Unfortunately, while Shekhar Kapur opens up the action and opts for a much lighter palate this time round, with at least a trailer's worth of striking visuals, the results are not particularly compelling. By focusing on the best-known part of the Virgin Queen's reign there's less of the constant sense of danger that marked its predecessor even though it amps up the threat by pitting her not against her own court but the might of the Spanish Empire and its Armada. Yet, being a sequel, it adheres to the `the same but different,' and there's certainly a strong element of d¨¦j¨¤ vu: the dastardly Catholics are still plotting her death, with Rhys Ifans and Samantha Morton taking on the Daniel Craig and Fanny Ardant roles of Jesuit hitman and conspiring Scottish queen. And, as before, history isn't well served, with the film offering the notion that Philip of Spain conspired to force Elizabeth to execute Mary Queen of Scots to give him an excuse for a holy war. The script certainly could have been better, running down rather than gaining momentum as the Armada approaches and dropping the ball in many of the obvious slamdunks. Certainly if you're going to omit Elizabeth's famous "I may have the body of a weak and foolish woman, but I have the heart of a king" you need to come up with something with more guts and bravado than the tired horseback speech she gives to rally her troops. Even worse, the Armada itself is something of an anti-climax. The almost painting-like CGi effects aren't as much a problem in a film as occasionally stylised as this as are the all-too obvious budget limitations that reduce it to the odd running commentary that makes it somewhat akin to listening to a football game on the radio. Performances are highly variable. Blanchett is suitably regal in the lead, with Geoffrey Rush and David Threlfall fare best among the courtiers, but Abbie Cornish makes little impression, Rhys Ifans just seems to be going through the motions and Samantha Morton is fairly awful as Mary. Both bland and risibly hammy at the same time, with her risibly overemphatic delivery she feels like a smug prefect in a school play playing up to the gallery rather than a credible conspiring monarch, giving easily the worst performance in the film even after the worst of her performance hit the cutting room floor. Yet the biggest surprise in the film is Clive Owen's Walter Raleigh. If at first it seems disastrous casting the zombie-like Owen as the representation of the life and love Elizabeth can never have, but, amazingly, for once he almost rises to the occasion. Like many a bad actor he's utterly hopeless in the moments that aren't about him, looking bored when he's supposed to be listening, displaying complete disinterest in his scenes with Abbie Cornish and sleepwalking through the battle with the Armada, but for once he handles his monologues - the best writing in the film - surprisingly well, even changing his expression a few times, though quite why he chooses to play his early scenes with a bad American accent remains a mystery. It's not a perfect performance (the deleted scenes on the DVD show that his flat delivery and lack of timing botched a gift of a scene with Rush), but for the first time there are signs that if he was willing to really put in the work and had a director who wouldn't mistake talking in a bored Coventry accent for a performance he could be a capable jobbing supporting actor. The 1.85:1 widescreen transfer is a bit disappointingly short on detail in some scenes, though there are a decent set of extras. This is very well done there are some great reviews on here but I do have one complaint and there is something Historically In-accurant and that is Elizabeth was a Protestant and did not seek Oricals and seek the stars for direction, she prayed to God, other than that the movie was very well done. Picking up shortly after Elizabeth I left off the movie portrays the complicated life of one of England's greatest Monarchs. Elizabeth The Golden Age, shows us the balance which was required of Elizabeth, balancing the incredible tenacity and guts it took to rule England and her fears and longings for real love and security. Elizabeth's life is a story of overcoming the odds. Born second child of Henry VIII and his second wife Anne Boleyn, she was supposed the be the long awaited and promised son of the King, yet Henry's wishes for a son were dashed upon her birth. In the first movie we see the growth of her strength which Elizabeth must muster to survive, and in The Golden Age we see the strength come into full bloom, the strength she will need to overcome the looming Spanish evasion and the always present question of marriage and producing a male heir. Europe has become divided by Protestant and Catholic, and Elizabeth's own country and family has fallen along divided lines as well. Queen Mary of Scotland sits to the north imprisoned by Elizabeth, but Mary possesses something that Elizabeth does not have, the backing of Catholic Spain and France. For Elizabeth it is only a matter of time until she will be called upon to do something about the looming threat of Mary. When that time comes we find Elizabeth torn between what must be done to a trader and the rights of a sovereign Queen like herself. It is this decision which leads to the climax of the movie. Mary is favored by Spain and with the outcome of Mary's fate, Spain steps into action to crush the Protestant [...] Elizabeth. 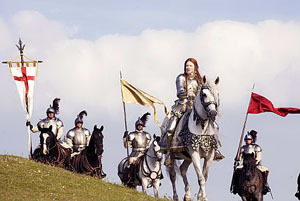 Elizabeth faced with an impeding invasion of the Spanish steps forward to encourage her countrymen in the battle and protect her beloved England. However The Golden Age is not solely about the battles between countries but the battles of the heart. Elizabeth although known as the Virgin Queen is not without the need of love and passion. Yet Elizabeth knows that this could pose as big a threat to her and her country as the Spanish and French. A superb sequel to the masterful Elizabeth! I was deliriously happy to see that this sequel to Elizabeth was in production and waited most impatiently for its release. We bought both segments in the glorious HD format and were delighted by the quality and depth of color and detail. 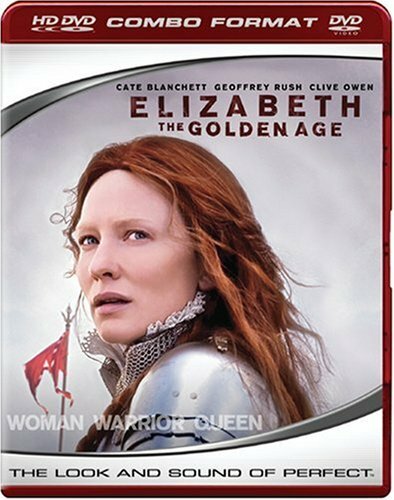 "Elizabeth: The Golden Age" is a continuation of the life and loves of Queen Elizabeth I of England as portrayed by Cate Blanchett and directed by Shekhar Kapur. The first "Elizabeth" was a perfectly watchable costume drama, but never quite made it to excellence. The sequel leaves more to be desired. Of course, when devout religious believers, politics, and a megalomaniac monarch meet, things get a little dicey. King Philip of Spain, under the pretext of avenging the execution of Mary Stuart (history is a little distorted here) launches his massive Armada to England, but is defeated by a storm. The film lacks the emotional depth and lacks pathos for the character. Also, the defeat of the Armada completely lacks any sense of urgency or desperation that the English must have felt. I adored the first Elizabeth. It was perfect in it's script and flawless in it's acting. After watching The Golden Age however, I was utterly distraught. I cannot believe that this is made by the same man who directed the first film. It just doesn't seem possible. Everything from the script, to the editing to the actors that don't belong, it just doesn't work or flow. If there is one redeaming aspect of this film, it is the once again brilliant performance by Cate Blanchette. She can do no wrong. She is one of the most skilled actresses out there, anywhere. However, my gripe is actually with her character. She doesn't even seem to be the same Queen from the first Elizabeth. Granted, years have passed, but this Elizabeth comes off as weak and undecided, jittery even. It doesn't feel right. Abbie Cornish also feels very wrong as the Queen's favorite lady-in-waiting. She is very out of place, no matter the beautiful costume she is wearing. Samantha Morton as Mary Stewart is UTTERLY wasted. They could have just cast some unknown, so small and barely noticable a part she played. One of my favorite actors, Geoffry Rush was shamefully placed in the background and barely had anything to do with this film. His character was a favorite of mine in the first film. Clive Owen is pointless in this. His character feels neither here nor there. Wrong choice in actors, I guess. The plot was also confusing, it jumped around way too much and you never really know how much time has passed. There is no mystery or intrigue. Nothing to captivate. The final and supposedly huge battle is a few boring minutes long and feels almost out of place. The costumes and wigs are magnificent, as in the first film. Again, one of the only bright spots. Elizabeth The Virgin Queen, who bet her own happiness in pursuit of her people, and knew to move the pieces of her Army and navy with notable intelligence is carved in relief once more in this mesmerizing film who allows us once more to admire Cate Blanchet one of the top ten actress all over the world, in this gripping and colossal movie, told with impeccable sobriety thanks to a dynamic and fluid script. With monumental stages and unforgettable landscapes, the film is not only a fest for your eyes but also an important reflection about political leadership in those hard times She was the decisive turning point who conveyed England to become the next Empire of the Western world, after the fall of Spain. I anticipated the arrival of this DVD very much after I ordered it. Historically correct, with a few tweaks, this film gives a very insightful view of England's "virgin Queen". The film only captures a very short amount of the life of Elizabeth, and provides a very dry love story, but I must say that the costumes and make up in this movie are fabulous, fabulous. All in all, it was very entertaining, I'm proud to own the DVD, but I will probably only pull it out about once a year or so. Superb Acting but Little Historical Accuracy. This is indeed a very colorful production and the acting is all pretty good, especially Kate Blanchette. -- First there is the mis-blending of plots and episodes in the movie: Elizabeth's affairs at court with Sir Walter Raleigh shares about the same screen time as does the war with the spanish. But neither get dealt with properly or fully - they get dabbled in ... pity. I am not sure how accurate the movie is. I honestly don't know but as a general history lesson it brings up interesting stuff about the religious background to spain etc. If it is correct in it's depictions then as a believer in secularism I am glad the spanish armada did not succeed againt England. The church has a lot to answer for in history no doubt. I say that tough I now live in Spain myself and love it to bits. -- The second problem is the presence of Hollywood - the over-iconiation of Elizabeth is a pain amidst all the continuous background synthesized wall-to-wall dribble music. When will these producers ever learn? With all the classical music available not to mention endless abstract pieces that could have been used, I cannot understand the dullness of mind which the director is guilty of here. This is why this movie will always be a "B" flick. What a pity! A bit of simple taste and it might have been a classic. Certainly the stunning visual settings and costumes were all up to it. I wish Hollywood would learn. Maybe take a page from A Man for all Seasons - pace things on the screen a little bit more rather than bombarding the viewer with this overproduction. Modern technology is great but we need to know when not to apply it. Especially having spend all the time and money. Let me give one small example of what I mean: There is a scene at a late stage of the file where the camera rotates a few times round a beautifully crafted doll/statuette of the queen(Kate Blanchette). Really marvelous idea but not at this stage of the story and for so long with all the meaningless background music raging. The film at this stage was boring and the scene served only to irritate this viewer - I just wanted it to end. Why not have this maybe in the opening scene and without the sound assault?! An immaculate and glorious visual feast, featuring Elizabeth I's inspired leadership of England, during the 1580s. The basic threads involve her enlightened rule and refusal, of the advice, by her council to persecute her Catholic subjects, the imprisonment of Mary, Queen of Scots (Samantha Morton) and the Babbington Plot leading to Elizabeth being forced by her council especially Francis Walsingham (Geoffrey Rush), the relationship of Elizabeth (Cate Blanchett) with Sir Walter Raleigh (Clive Owen) and his love of Elizabeth's beautiful lady in waiting, Bess Throckmorton, played charmingly by the exquisite ( Abbie Cornish), and of course Elizabeth's rallying of England against the Spanish armada which threatened to invade and conquer England and bring with it all the horrors of the inquisition. It also briefly features Elizabeth's consultation with the astrologer and psychic John Dee (David Threlfall). Most inspiring is Elizabeth's leadership in resisting the Spanish invasion and her rousing speech to the assembled English troops (although not including her famous word about having the feeble body of a woman but the heart of a king): "My loving people. We see the sails of the enemy approaching. We hear the Spanish guns over the water. Soon now, we will meet them face-to-face. I am resolved, in the midst and heat of the battle, to live or die amongst you all. While we stand together no invader shall pass. Let them come with the armies of Hell; they will not pass! And when this day of battle is ended, we meet again in heaven or on the field of victory". While there is much that is not historically accurate, this is high drama at it's remarkable best, never falters in it's pace or it's majesty, and capture both the greatness and capriciousness of Queen Elizabeth I. It is inspiring and exciting to see how she leads her nation in struggling against the darkness that would be imposed by the Spanish Conquest of England, with an imposed inquisition. A struggle of a free land against the darkness of backward religious intolerance and destruction. There have been so many versions of Queen Elizabeth's life, but I believe this one will stand out. 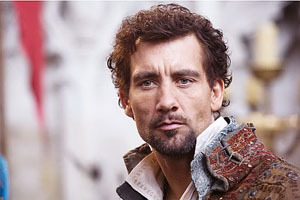 I loved Clive Owen as Sir Walter Raleigh, and of course Cate was superb. A young queen is torn between her country and allowing herself to fall in love or be loved. Focusing on her country at a time when her throne and people need her undivided attention is an intense, bittersweet glance into another Era. When Elizabeth is tricked into allowing her cousin, Mary, Queen of Scotland, to be sentenced to death and beheaded, Elizabeth's spirit and ability to face and fight the mighty Armada of Spain are fully tested. to me, cate blanchett is one of ten english-speaking actresses that could croak the abcs and i would buy a ticket for it. so, i didn't find my way to 'elizabeth: the golden age' for a history lesson. likewise, i'm not an anglophile and have some feeling that the english have done some really funky things in the name of their queen. but that aside, i have nothing but admiration for blanchett's second take on the virgin queen under kapur's fanciful direction. blanchett and kapur made their chapters in the queen's life a romantic, lush film with hints of political intrigue accompanied by stunning visual and design effects (the watching eyes of the ladies in waiting as elizabeth and sir dudley make love turning in to prints of eyes on her drapes is still so wist ful and enchanting). kapur was also able to give screen time to more than a few actors like daniel craig. craig is now the british flavor du jour. not to mention kelly macdonald and emily mortimer as two of elizabeth's ladies in waiting and the wonderful kathy burke as queen mary. now the visuals are just as stunning--and from what i gather as anachronistic--as before. alexandra byrne's costumes are even more sumptuous than before and very worthy of their academy award. and geoffrey rush is on hand again as elizabeth's advisor and he is even more authoritative. and as for cate--she is just as magnificent as she was before. now she is power incarnate as she presses through the cavernous sets in her array of silks and brocades. and she has more than a few moments of vulnerability as she watches her favorite lady bess dance with her favorite lord, sir walter raleigh and relives when she was younger. her last night talks with her lady bess are also warm and filled with many depths. now i wish that the score could have been a little more right and less a wash of strings and whatnot that make up the standard historical epic score. and even though it may or may not be a huge part of british history, i would like to have seen more of samantha morton. after all, she is a very good actor and mary, queen of scots is a very good role.